So I've been using it for about a full day now and noticed some issues. RAM management seems pretty aggressive. Apps that I normally run in the background while doing other things like YouTube, Google play music just shut down on me after I open a few other apps. I notice even the most recent apps I've open restart as well. I'm using an unlocked version from the Google store on T-Mobile and have notice slower speeds than my 2 XL. I figured with the updated bands it be faster but I'm noticing slower speeds. Have y'all notice any of these issues or any other type of issues? 4 GB of ram is not enough in this phone, despite googles optimization. I haven't experienced that yet. 23 apps open in the background. I haven't experienced it yet either but I also never had issues on my 2xl which I still have . only had it for few hours so I'll monitor it. Mike how you liking yours so far ? MKBHD highlighted this problem with his Pixel 3 XL review on YouTube. You seeing any issues on yours ? I've had issues with maintaining cellular service on Verizon (for reference, I'm using a Pixel 3 purchased through the Google Store) and I also had a short period of time where the gesture system completely failed. During this time, the home button would extend the entire length of the bottom of the phone when I'd try to quick switch apps but do absolutely nothing. A reset did fix this issue and it hasn't popped up again since then. Everything is working solid here. 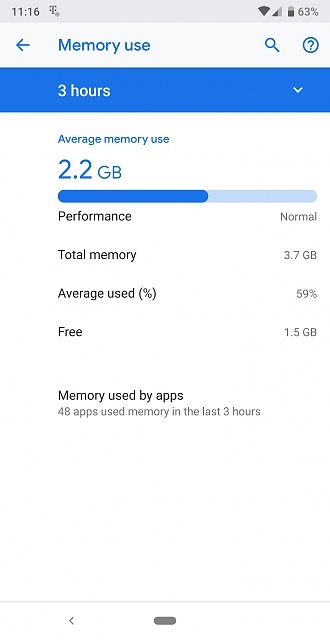 Memory use shows 48 apps used memory in the last 3 hours. Oh wow , hopefully just a glitch that won't happen again. That was slightly different though the outcome may be the same. That was the camera causing issues. I was able to replicate it but only happens in advanced modes. Nice !! I'm loving it so far also.. The upper part of my phone got hot when I was streaming Netflix for about 35 minutes tonight. Like too hot to touch? To get warm is normal like YouTube and Netflix. No, not too hot to touch. It was warmer than usual. I've never had that on other devices while streaming on WiFi before. Gotcha , maybe just being new and being in use . Keep a eye on it and see maybe once battery settle in be ok . If it's anything like the pixel 2 the majority of those will have to reload if you went back to them. Just because they're shown in the app window doesn't mean they haven't been killed. Are you sure it's not Adaptive battery just doing it's thing . That's true of apps that require reloading like games but a portion of the app is still in memory regardless. Your swipe up list is just a history of recently opened apps, not a list of apps fully open in RAM. Yes, some killed apps will have background processes loaded in RAM (e.g. email apps that periodically check for mail), however the killed app will have to reload from storage if you want to view it again. That's very different from having "23 apps open in the background." How to transfer mp3 to pixel? 16:9 Content Playback on Pixel 3.